Just wanted to say hello. 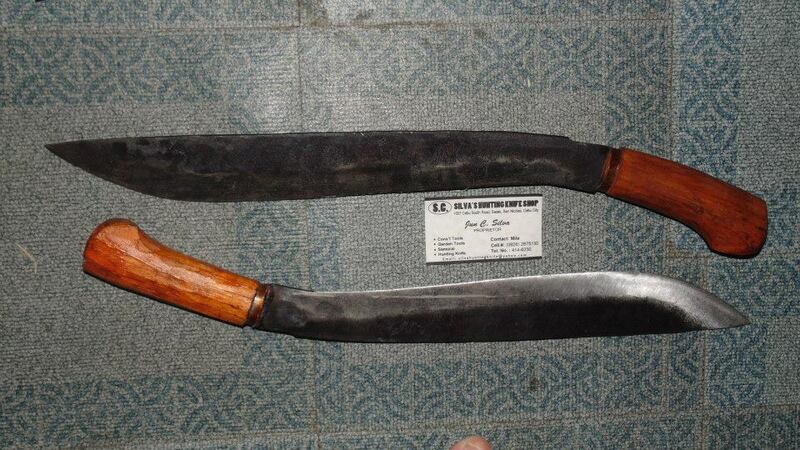 Have some pictures of sundangs (machetes) which have been hand made in the Philippines. Will post more later. I have examples from Cebu and Dumaguete, which show interesting regional variations. They're making these in backyard forges from truck leaf springs. Jun SIlva's pretty well known in the Philippines. Recently got one made by his son and it was ok. Fantastic wood work but the blade wasn't all that well tempered and ground. I'll post some pictures of one made in Dumaguete, later. I think the 696 is the Peso price - which is about £10. Dumaguete is expensive - IIRC the Jun Silva ones were cheaper, the banana wood ones were about £2.50 and the leather handle one was £10. Mind you, I bought the Jun Silva ones a couple years before the Dumaguete ones and inflation rages in the Phils. If anyone wants more pictures I can post. I have friend with a lightbox and fancy camera if really necessary. I'm pretty sure the bottom one is made as a weapon (it's certainly heavy enough that splitting someone's skull wouldn't be a problem) although the others are simply wood chopping tools. As far has history goes they've been making sundangs like this certainly for many decades and they look authentically old right out of the box... not that they're actually sold in boxes, of course. 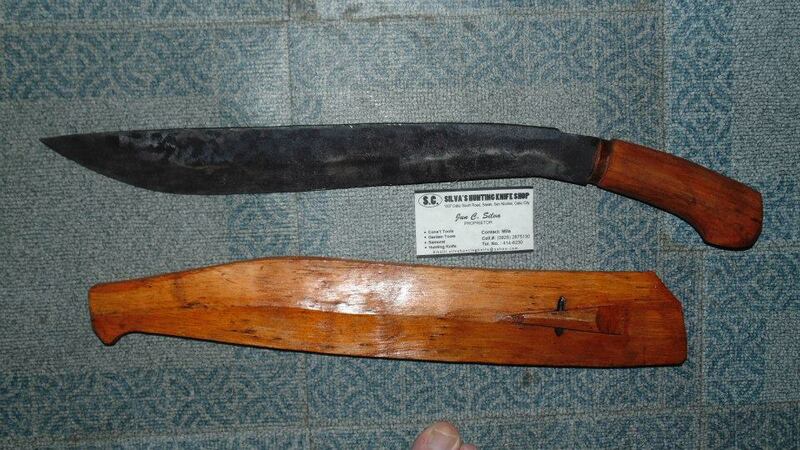 Sundang for chopping wood, high carbon steel blade chisel ground (leaf spring) wooden handle (banana?) and sheath. Not banana wood; banana isn't woody. Looks like guava. Not sure that weight is a good way to tell whether it's a weapon or tool, unless it's really light or really heavy (both telling you "tool"). 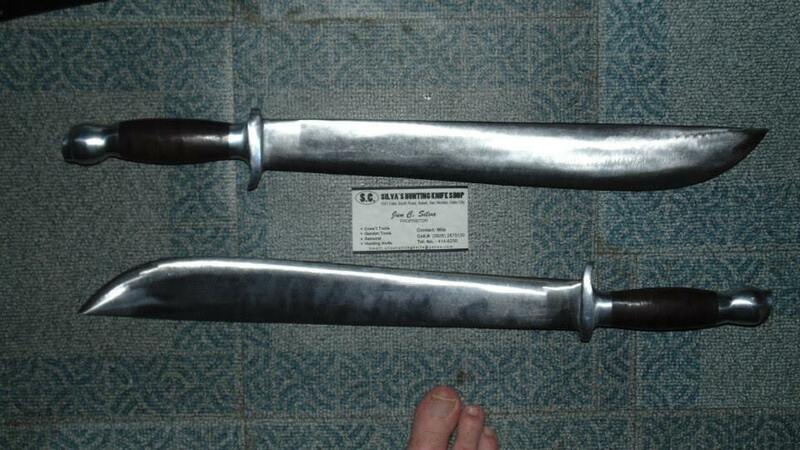 560g, about 15.5" of blade. Cuts beautifully, and it's drawn more blood from me than any other sword I have (I stabbed my thumb while cleaning it). I think they call it banana wood but that may be because it's used for banana boxes. It is heavier than the other blades and all that polishing suggests it's not simply a working tool. I'm a fan of hammers for anti personnel use, so what do I know. That blade of yours is really nice, I'll be keeping a lookout of something like it on my wanderings around the Phils. Still wanting to go to get some balisong... but they're banned in Cebu, ironically enough. The hilt construction suggests it's made as a weapon. Maybe a martial arts weapon rather than a weapon weapon. That is, a weapon for training rather than using for real. It's both really. 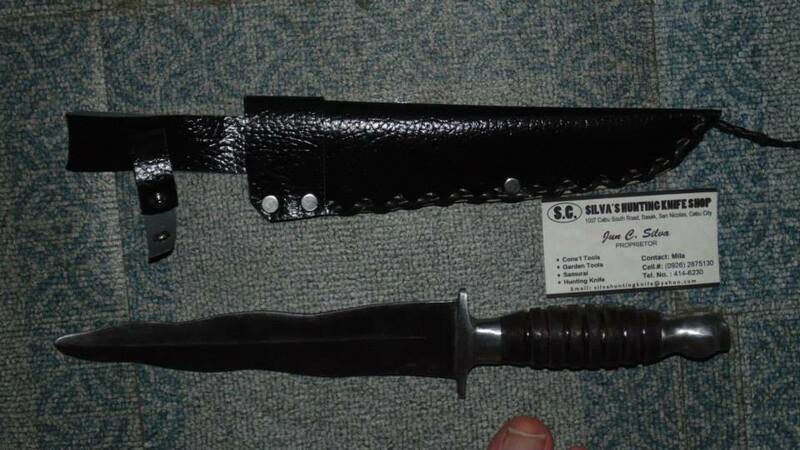 You can buy them sharpened or blunt, the idea is to have one as a training weapon and one for live. The one in the picture is a sharpened one. 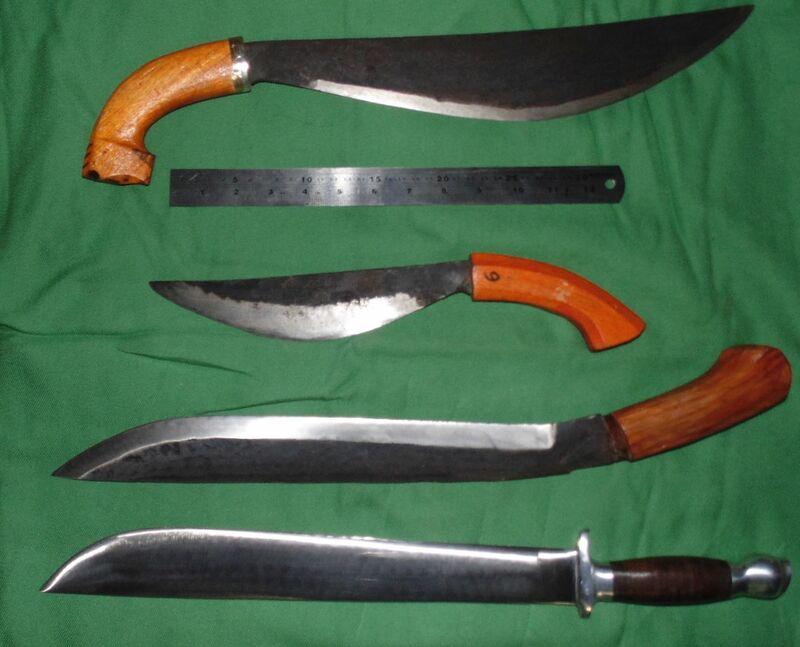 The Keris, on the other hand, is a blunt one (they'd run out of sharpened ones). If you phone a few days before you go to his shop you can order a matched pair, one sharp and one blunt. Cebu is the original home of stick and knife and they aren't shy about sharp instruments and using them for serious social purposes. Hence I suppose banning balisong, again Cebu by some accounts being the birthplace of the balisong.